Following the winter storm of November 10th, cold air has dominated the state. Through November 20th average monthly temperatures are running from 6 to 9 degrees F colder than normal, marking the coldest November since 1996. A streak of 12 consecutive days with no temperature reading of 32 degrees F or higher at MSP is the 2nd longest for the month of November, topped only by 15 consecutive days back in 1880. Pete Boulay of the Minnesota State Climatology Office has a nice feature on this. Fosston (Polk County) reported the coldest temperature in the nation on November 20 with a reading of -11 degrees F, and Cotton reported the nation's coldest temperature on the 21st with a reading of -20 degrees F. On five dates so far this month Minnesota has reported the coldest temperature in the nation. The NOAA Climate Prediction Center released a new seasonal climate outlook on Thursday of this week (Nov 20). For the Western Great Lakes Region they see equal chances for above or below normal temperatures and above or below normal precipitation during the December through February period. The western states are expected to see above normal temperatures prevail and the southern states below normal temperatures. Less than normal precipitation is forecast for the states east of Minnesota, including Wisconsin and Michigan. A good discussion of the new seasonal outlook is presented by NOAA Meteorologist Mike Halpert. In addition drought persistence is forecasted for the far western counties of Minnesota, notably portions of Wilkin and Traverse Counties. Currently much of the state landscape is under a 2 to 4 inch snow cover (a result of the winter storm over November 10-11), and soils and lakes are beginning to freeze up for the winter. Currently frost depths in the soil range from 2 to 6 inches depending on snow cover. 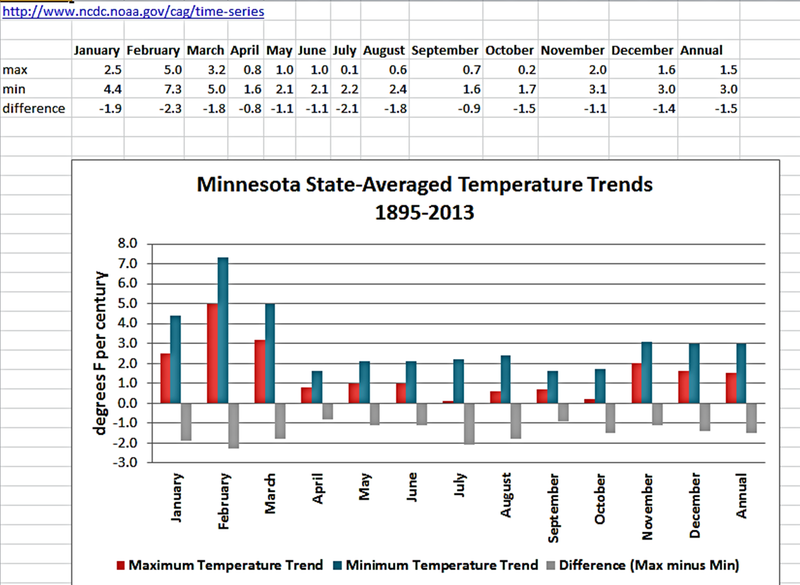 The NOAA-National Climate Data Center climate at a glance feature shows the details of Minnesota state temperature trends and how very much they are weighted to increasing minimum temperatures rather increasing maximum temperatures. The pace of increase in minimum temperatures since 1895 is roughly twice that of maximum temperatures on an annual basis. This is real data and should not be dismissed. Speaking of cold, NOAA has recently analyzed when the coldest day of the year occurs across the USA. Naturally there is a great deal of variation. Across Minnesota it is typically during the 3rd or 4th week of January, but in the mountainous western states it is often in December. You can find the NOAA report, along with a map on line. A NOAA Climate Resilience Tool Kit is now available on line to examine ways to evaluate risk from weather and climate extremes, and then to assess the options to take action to mitigate these risks. Earlier this week on Tuesday, November 18th NOAA described a rare event, freezing temperatures were being reported in all 50 states. Nationwide it was the coldest November morning since 1976, with temperatures in the 20s F reported from the Florida panhandle. In addition NOAA reported a national snow cover of 50.4 percent over the USA landscape. This is the largest mid-November percentage snow cover reported in the USA in several decades. The St Paul District of the Army Corps of Engineers locked the last tow of the season for the St Paul, MN area on Thursday (November 20) this week as the ice conditions on the Mississippi River are getting difficult for vessels to navigate. Thus ends the navigation season of 2014 on the upper reaches of the Mississippi River, a season that opened last April 16th, a later than normal date because of prolonged ice thickness on Lake Pepin last spring. The official Army Corps press release describes more detail. The American Geophysical Union offered a news release this week based on a recent study headed up by Dr. David Ridley of MIT which shows that a series of recent volcanic eruptions may have played a role in slowing done the pace of warming detected in the global temperature record. This study will appear later in the Geophysical Research Letters. Do you think we'll have snow for Thanksgiving this year? Analysis from Pete Boulay of the State Climatology Office shows that for the Twin Cities snow falls on Thanksgiving day about one year out of five. The way the forecast models are trending for next week, it does appear there will be a chance for snow Wednesday night and into Thanksgiving morning. Temperatures are expected to be cooler than normal as well. In addition I would add that for the Thanksgiving 4-day weekend snowfall occurs about 60 percent of the time in the Twin Cities area and close to 75 percent of the time in northern Minnesota communities. The MN SCO data for Thanksgiving Day may be of interest to you. The average MSP high temperature for this date is 37 degrees F (plus or minus 11 degrees F standard deviation), while the average low is 24 degrees F (plus or minus 10 degrees F standard deviation). MSP weather records for this date include: highest daily maximum temperature of 67 degrees F in 1990; lowest daily maximum temperature of 5 degrees F in 1880; lowest daily minimum temperature is -11 degrees F in 1880; highest daily minimum temperature of 42 F in 1963; record precipitation of 0.54 inches in 1994; and record snowfall is 4.8 inches in 1989. Average dew point for November 21st is 20 degrees F, with a maximum of 58 degrees F in 2001 and a minimum of -2 degrees F in 1959. The state record high temperature for this date is 72 degrees F at Tracy (Lyon County) in 1962. The state record low temperature for this date is -25 degrees F at Tower (St Louis County) in 1978. State record precipitation for this date is 3.04 inches at Lake City (Wabasha County) in 1996; and the state record snowfall for this date is 16.0 inches at Montevideo (Chippewa County) in 1975. ZEUS is a new airborne measurement system developed by the United Kingdom Meteorological Office and the Natural Environmental Research Council to assess the presence of volcanic ash in the upper atmosphere, more specifically across long distance air traffic routes. It is a device capable of detecting amounts of volcanic ash in the air by measuring small changes in electrostatic charge. A British Airways 747 has been fitted with the ZEUS device and made a successful measurement run between London and Johannesburg, South Africa. Hopefully such measurements will assist forecasters in making better route forecasts for the airlines industry. Two of the coldest November 21st days occurred in the 19th Century. In 1880 Arctic air resided over the state producing morning lows of -13 degrees F at Duluth and -11 degrees F at St Paul. The daytime high temperature reached only 2 degrees F at Duluth, while St Paul only made it to 5 degrees F. November 21, 1896 also brought Arctic cold to the state with morning low temperatures of -14 degrees F at Milan, -16 degrees F at New London, and -21 degrees F at Detroit Lakes. The daytime high only reached -2 degrees F at Crookston that day. November 20-21, 1973 brought a major winter storm to Minnesota, but instead of snow it developed enormous amounts of rainfall as air temperatures remained in the 40s and 50s F. At least 30 Minnesota communities reported over 2 inches of rainfall, while St James reported a record 3.03 inches. A major winter snow storm disrupted traffic and caused school closings over November 19-21, 1975. The heaviest snow fell across central portions of the state. Reports included 24 inches at Canby, 17 inches at Willmar, 16 inches at Montevideo, Tracy, and Minnesota, and 15 inches at Marshall. November 20-21, 1990 was a true Indian Summer period with very mild temperatures and sunny skies dominating the state. Most northern observers reported daytime highs in the 50s, while over 80 communities across central and southern Minnesota saw the thermometer reach or surpass 60 degrees F. Stillwater, Winona, and Austin reached the 70 F mark, setting new records there. Milder over the weekend with some thawing temperatures, perhaps even low to mid-40s F in places. Increasing cloudiness on Sunday with a chance for light rain, turning to snow by evening. Chance for occasional snow and patchy blowing snow on Monday into Tuesday, then cooler temperatures for Tuesday through the end of next week. Chance for snow again on Wednesday night and later into Thanksgiving weekend.